A popular restaurant and bar in Lakeside caught fire early Saturday morning, causing extensive damage to the kitchen and roof, and smoke and water damage to the rest of the business, according to the Lakeside Fire District. 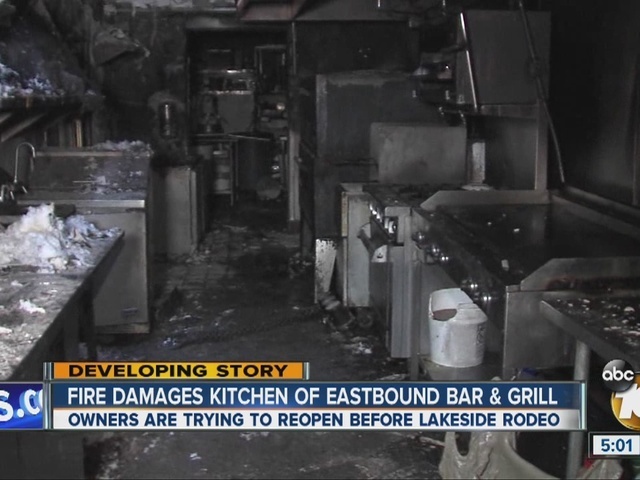 It took firefighters about 10 minutes to put out the fire that broke out shortly after 4 a.m. at the Eastbound Neighborhood Grill in the 10000 block of Maine Avenue in the old downtown Lakeside business district, Capt. Scott Culkin said in a statement. Twelve crews from Lakeside, Santee and Heartland Fire responded to the blaze and were credited with saving the business from becoming a total loss. The first crews to respond were on scene in less than five minutes, according to Culkin. San Diego County sheriff's deputies also responded to the scene. The cause of the fire was under investigation. An estimated dollar amount for the loss was not released by fire officials.